A large group of senior Democratic lawmakers have been caught attending a hedonistic party in Puerto Rico, despite the government shutdown. Over 30 Democrat lawmakers took a chartered flight to Puerto Rico to “party hard” with 109 lobbyists and corporate executives, lavishly spending money to see Broadway show “Hamilton” and attend an array of parties including one with the show’s cast. 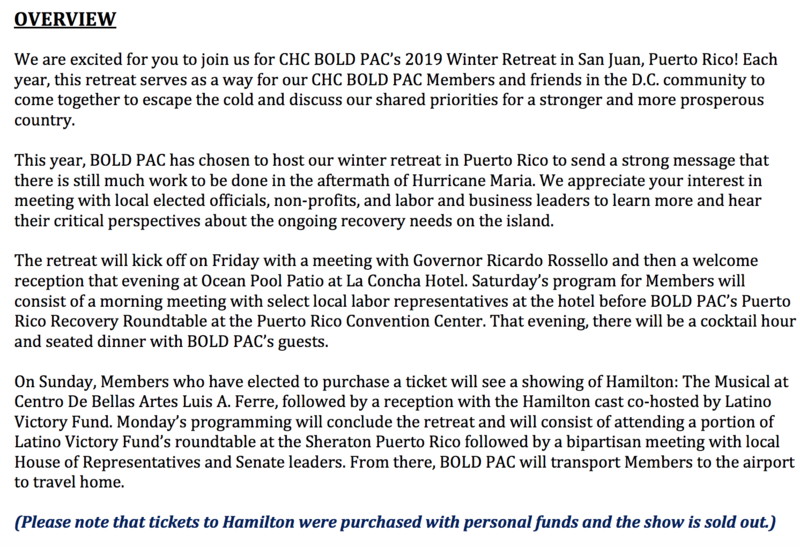 Washingtonexaminer.com reports: Those attending the Congressional Hispanic Caucus BOLD PAC winter retreat in San Juan planned to meet with key officials to discuss the cleanup after Hurricane Maria at a roundtable Saturday. The event is taking place in a seaside resort where rooms go for $429 a night. Food is being provided. A spokesman would not identify the members, but Secrets obtained a list that included several congressional leaders. On the list was Speaker Nancy Pelosi, but an official in her office said that she did not make the trip. Neither did Assistant Speaker Ben Ray Lujan, a spokeswoman said Saturday. “This year’s winter retreat promises to be our most widely attended yet with over 220 guests, including 39 Members of Congress and CHC BOLD PAC supporters expected to attend and participate!” said the planning memo. The trip represented the largest congressional delegation to Puerto Rico since the September 2017 hurricane and members were to spend part of their time focused on that issue, according to the schedule. In addition, their chartered jet carried 250 pounds of donated medical supplies. But the junket comes at an awkward time, on the day 800,000 federal workers did not receive their first paycheck of the shutdown, with many worried about basic living expenses like food. The members paid for Hamilton tickets on their own. The party with the cast is sponsored by Latino Victory, a Democratic political action committee. They are scheduled to see the show Sunday and return home at 4:45 p.m. Monday. Cristobal J. Alex, the president of Latino Victory, tweeted that the gathering will focus on the island’s recovery. “We’re on the ground in #PuertoRico prepping for this major gathering. The island is still reeling for Trump’s failures. There are displaced in need. We need Congress to act. @latinovictoryus,” he tweeted. In Dec 2018 GOP House passed a bill to keep the government open and sent it to the Senate for a vote. The bill got 51 yes votes. HOWEVER, Senate democrats used a Senate rule to prevent the House bill from being passed in Senate with a simple majority vote. The rule requires 60 votes to pass the bill. If the dems did not enact this Senate rule we would not be in a shutdown today.